Copy the contents of a field in any record type to a field in any other record type. Set the field to a specified text string, or set the value to blank. AnyText can be used to prepend or append text to a field, to combine fields, and to move data between fields. The name of a merge field, e.g. ~Contact.Phone3~ or ~Opportunity._ProjectTitle~. Any Text Anywhere will copy the value it finds in that field to the field being updated. The name of the field you would like the text copied into, e.g. Contact._NextProject. Do not use tildes (~) around the field name. If add multiple textToSave/saveTo pairs, you must add a number in brackets that matches for each pair, beginning with 0, e.g. “textToSave” and “saveTo” followed by “textToSave” and “saveTo”. 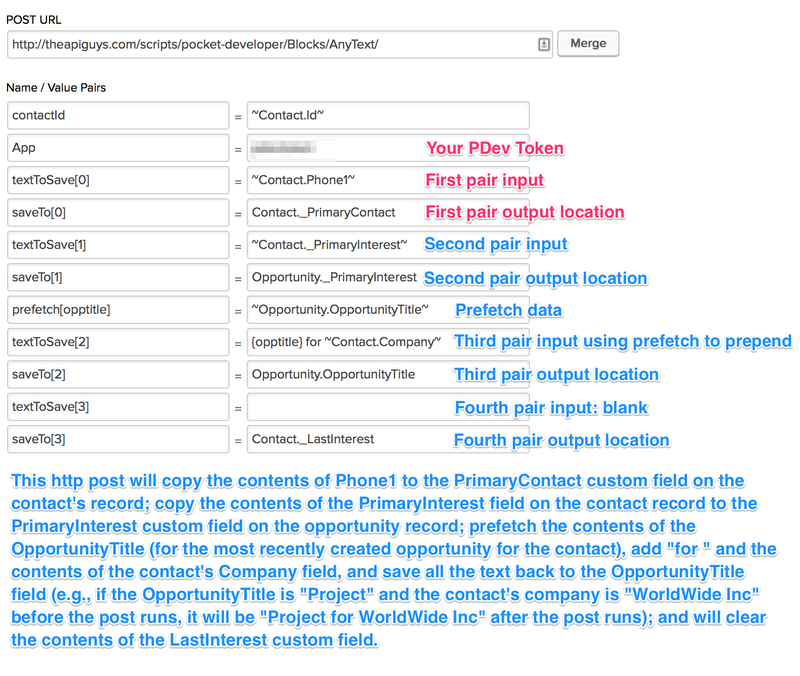 To append text, use Prefetch to store the destination field’s contents and add the prefetched data back to the same destination field along with the appended text. Use Advanced Merge Field Notation to dramatically extend the capacities of AnyTest.